The RVSL-1111 high vacuum Aluminum soldering furnace is horizontal type with front door & back door design. High pumping speed oil diffusion pump groups, full metal shield insulation layers, fast pumping speed & inner clean. It’s used in aluminum base materials vacuum brazing, finished works keep bright surface & non-oxidation. The control system was controlled by PLC, Manual or Auto undisturbed switches and alarm function for abnormal condition, high automation and easy operation. 3.Cooling water flow rate: abut 30 M3/h; PH value about 7; Soft water without any sand or inclusion. 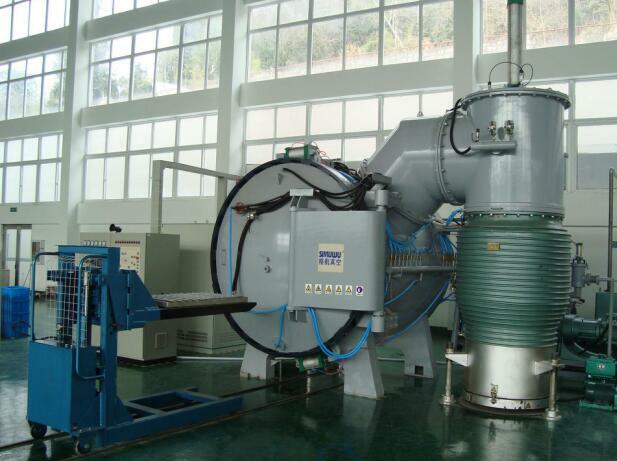 RVSL-1111 vacuum furnace was assembled by vacuum system, shell, heating chamber, control system, cooling system, water cooling system, air charging & degassing system, pneumatic system, temperature measuring system,& feeding.